We've all tried untangling knots in hair, earphones and other wires. Ever wondered what it would be like to untangle a human body knot? The Funskool Twister game will literally leave you in knots and not just laughter wise. 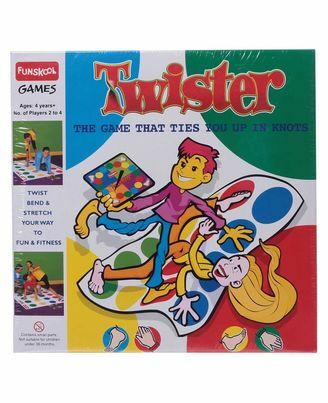 Play with a group of friends and go crazy with excitement as you intertwine every body part and try to outmanoeuvre your opponents playing Twister. Children from ages four and above can play this incredibly fun twister floor game. It includes a Twister mat, a spinner board and a spinner arrow. Funskool Twister will leave your kids twisted in the funniest knots, all to win the game. Assign the spinner board to one person, while the rest of the players place themselves around the mat. Bright, round multicoloured circles are arranged in organised rows on the Twister mat. Each player is given a command, like 'Left foot blue,' or 'right hand green.' After a few commands, every player is entangled with the other and is to remain in those hilarious positions without falling. The last remaining player on the twister mat emerges as the winner.